For the fifth consecutive year in a row, the Canada Revenue Agency's snitch line has received tens of thousands of tips about suspected tax cheats. For the fifth year in a row, the Canada Revenue Agency's snitch line has received tens of thousands of tips about suspected tax cheats. For the 2017-2018 fiscal year, the CRA received a total of 32,157 leads regarding suspected domestic tax cases. That number has hovered around the 30,000 mark since 2013-2014, when 29,984 leads were called, mailed, faxed or sent in online. Because the CRA program promises anonymity, a spokesperson said the federal agency can't say how many people have used the program, making it hard to tell if some individuals are phoning in multiple complaints. Over the same five-year period, the CRA says it has convicted 307 taxpayers. "This involved $134 million in federal tax evaded, and court sentences totalling approximately $37 million in court fines and 245 years in jail," CRA spokesperson Etienne Biram said in an email. The CRA also runs a separate program to report offshore tax evasion — with one added incentive: a cut of the pie. Launched in 2014, the offshore tax informant program pays people who have specific and credible information on major international tax non-compliance. But it yields far fewer tips. Last fiscal year, a total of 289 leads were sent in to the offshore program, down from 494, when the program first launched. Still, Biram said, "the program is working and informants are coming forward." The figures fly in the face of a recent government-commissioned focus group, where participants were adamant that they would never "rat" on a person to the CRA. The government paid polling and research firm Leger more than $156,000 to conduct the CRA's annual corporate research survey and assess Canadians' overall trust and satisfaction with the CRA. The focus groups told the researchers that while tax evasion and avoidance is wrong, they'd never sell out their fellow citizens to government tax collectors. "It is out of [the] question for participants to turn into informers for the CRA. None of them would report a cheater to the agency," reads the final report's analysis. "They consider that it is not their job to do this and they would not want Canadians to develop a culture of denunciation. They do not like the idea of citizens turning against each other." Participants said "they would not 'rat' on a person or 'be a snitch,'" according to the report's qualitative findings. 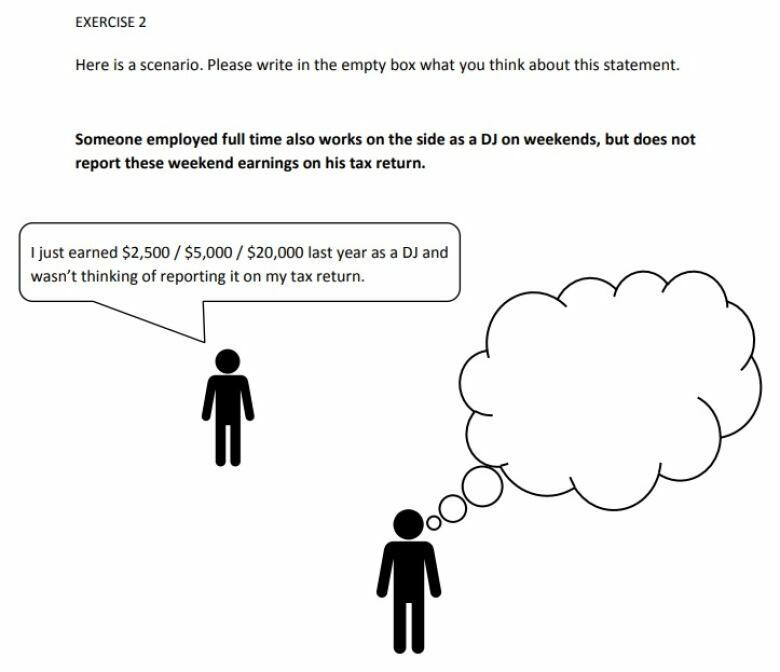 "This applied to both a person working 'under the table' and underreporting income to the CRA, and, for example, to a restaurant with two cash registers," the researchers said. Some participants questioned why the CRA would even ask Canadians to "turn against each other." "Some were rather cynical about the fact the CRA would encourage Canadians to report suspect behaviour. They believed that ordinary Canadians reporting the 'little guy' to the CRA while 'the big guy' is not bothered by the government would not even make a real difference in the end." The Leger focus groups were also asked about their general impressions of the CRA. 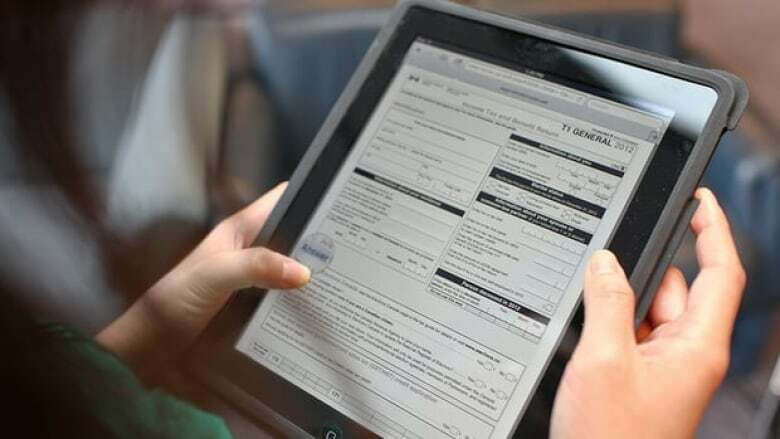 "Overall, participants tended to have a somewhat negative opinion of the CRA and the Canadian tax system when first asked to comment," says the report. "Words like myopic, unfair, stressful, inconsistent, complex, confusing, frustrating and rigid were among negative words used in more than one city." Leger ran 16 focus groups in Toronto, Brampton, Ont., Calgary, Halifax, Montreal and Sherbrooke, Que., polling a total of 141 people in January and February of this year. It also ran separate focus groups for the general population, for small- and medium-sized enterprises and for tax intermediaries. During those same months, the firm further conducted a telephone survey of 1,647 Canadians, but an analysis of those results has not yet been made public.